This revolutionary device is being praised by many for its potential skin benefits. 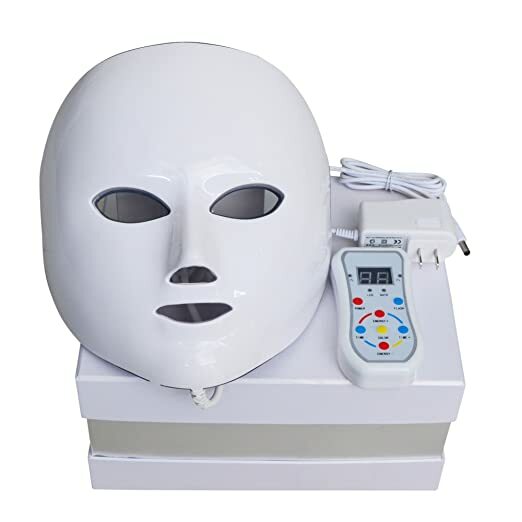 LED Photon Therapy masks have an array of non heat producing LEDs, which when set to different wavelengths “colors”, can produce a variety of different healing effects. You may have heard this type of therapy referred to as red light, Omnilux, or even possibly Lite Luxe. This mask in particular uses a similar technology, however is usable from the convenience of your own home. This form of treatment can help treat acne or even reduce the effects of wrinkling for younger brighter looking skin. Although there have been conclusive studies performed by several different agencies, the results claimed below can vary. In contrast, it has been said that in some way or form anybody can benefit from LED Photon Therapy. Red Light (650nm) Stimulates the production of collagen. Helps with reduction of large pores. Suitable for all skin types. Blue Light (463nm) Known to kill off Porphyrins which is mostly present in acne. Good for sensative skin. Can also tighten loosening skin. Green Light (527nm) Produces a balancing effect on color pigments, also assists with skin healing. Yellow Light (590nm) Improves the absorption of oxygen into skin cells to replenish and revitalize them. Promotes lymphatic drainage, improves rough skin patches, reduces wrinkling, reduces redness, and even enhances immunity. Purple Light (600nm) Combination of red and blue effects. Mostly effective on acne. Clear Blue Light (510nm) Promotes an overall healthy cell rejuvenating soothing effect. Cyan (470nm) Penetrates deep into skin tissues to accelerate tissue metabolism, degrade color spots, and even correct fine lines and sagging skin. Usage of this device is very simple. Recommended treatments are 15-20 minutes long and 3-4 treatments per week. When you start noticing results, limit treatment to 1-2 times per week. It is advised that you do not use this device for more than 20-30 minutes per day. This mask is also not recommended for those with photo-sensitivities. The manufacturer also suggests avoiding use on damaged skin. As an added bonus this mask can always double as a Halloween costume! Jokes aside go check out this LED marvel. Next articleCheck out these new LED flame light bulbs! valuable facts regarding mmy study and knowledge. CFL Bulbs vs LED Bulbs which are better? Check out these new LED flame light bulbs! leduprising.com is a participant in the Amazon Services LLC Associates Program, an affiliate advertising program designed to provide a means for website owners to earn fees by linking to Amazon.com and affiliated sites, as well as to other websites that may be affiliated with Amazon Service LLC Associates Program.